As i have been doing a few posts on GOSH Cosmetics products i wanted to share these with you and do a little giveaway! The prize is a black mesh GOSH Cosmetics cosmetic bag filled with a special edition nail lacquer in shade 012 splish splash, nail glitter in 03 grey moonstone and volume lip shine in 01 soft coral worth around £20. All you have to do is to be in with a chance of winning these GOSH goodies is to be a follower of my blog and comment below, with anything you want! Its as simple as that! I will choose the winner in a couple of weeks time, on Monday 7th May via random.org. GOSH products are available to buy exclusively from Superdrug stores & online here. Good luck lovelies & thank you as always for reading and commenting! Really want to try one of those glitter pots! I have to say, GOSH have some real gems within their range, I've purchased two of the those nail glitters recently, but still have yet to use them! Lovely giveaway Sinead :)Would love to win as I haven't tried any Gosh cosmetics before. The coral lipgloss looks GORGEOUS. :) Right up my street. Fingers crossed I win. Ohhh please enter me, I've never tried any Gosh products! Amazing giveaway!! I've never tried Gosh stuff before, always tempted by it though! Wow, I love Gosh products! Please enter me : GFC .x. Sarah .x. 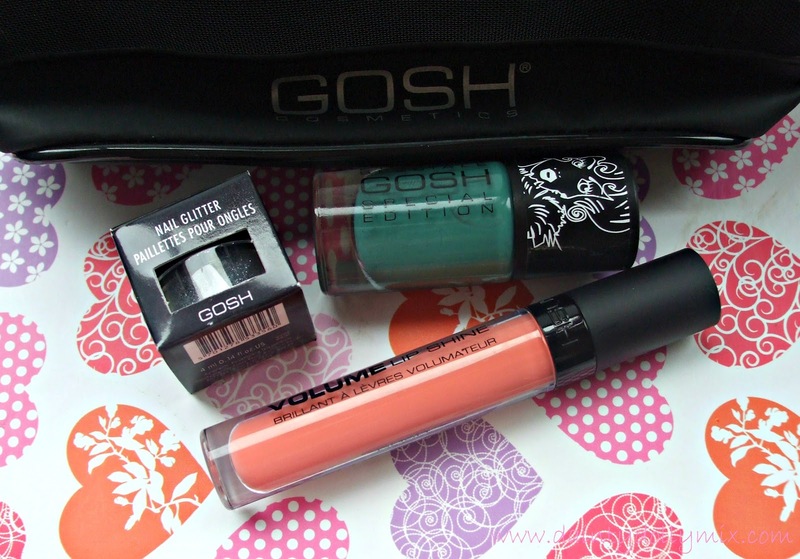 Gosh isn't a brand I tend to go for but their products look amazing! Wow, the glitter looks amazing! the glitter on top of the green nail!!! I'd love to try some GOSH products seeing as I never have before. Fab giveaway! looks amazing!! just posted but forgot to post my email haha. Great giveaway, Gosh is a really good brand. Their eyeliners and nailpolishes are my absolute FAVES! ohh I would love to enter! Have never really tried gosh. will defn keep my fingers crossed for this one! Enter me please! I've always wanted to try that nail glitter. The colour of the lip shine looks gorgeous! I'd love to be entered, the only thing I've tried from GOSH is the nail glitters (I have the pink and green ones) but I'd love to try some other products! Thanks for such a great give away! I've never tried GOSH as I live outside of the UK.. I'd love to win some ! Oh, I just love trying new makeup. Thanks so much for the giveaway! love to try these. i dun think I've seen Gosh around in Singapore. haven't heard about gosh. i want to try those!! Lovely giveaway, please enter me! Lovely giveaway, GOSH have some great products! Lovely giveaway hun. GOSH do some fantastic products in their line. I follow you on bloglovin, follow me back? Ooooh such a lovely giveaway, would love to be entered! Gosh products are fab, I'd love to enter. aw i love gosh n ur blog!!! Would really love that polish, I keep picking that one up and never get it! that green nail polish is the perfect colour! i've been looking for something like it forever and ever! Gosh cosmetics have a good reputation and I'd love the chance to try some more. i would like to win this prize please.. cuz i hv not tried GOSH products yet.. Following you with this GFC account. My e-mail is r dot m i k ura at gmail.